Just the right long underwear for your activity. Choose from Merino Wool, Cotton, Polypropylene, and more! For many people the very thought of long underwear for men brings out a little chuckle. While it may look a little different than what a man might typically wear, long underwear for men is extremely practical in colder climates. While some men have a job that requires long hours outdoors rain or shine and other men simply love taking a day off to play on the snowy slopes of some nearby mountains. No matter what your reasoning, purchasing a pair of mens long underwear is likely going to be one of the best decisions you can make for extended periods of exposure to the unforgiving elements of winter. 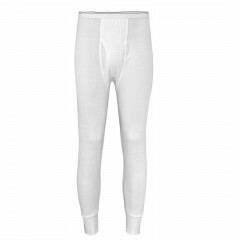 For many men looking to purchase a pair of long underwear it is surprising to see all the different options they have. There are several different brands to choose from, so make sure you choose a pair that will last for years to come. The best long underwear for men might cost a little more upfront, but the quality of warmth and protection provided by the better brands is well worth the extra cost up front. The top long underwear brands for men will provide not only better warmth and protection, but they are constructed to last for years to come. So when choosing which brand is right for you, take the time to consider how often you will use this underwear, and how valuable your comfort is.